B1591. 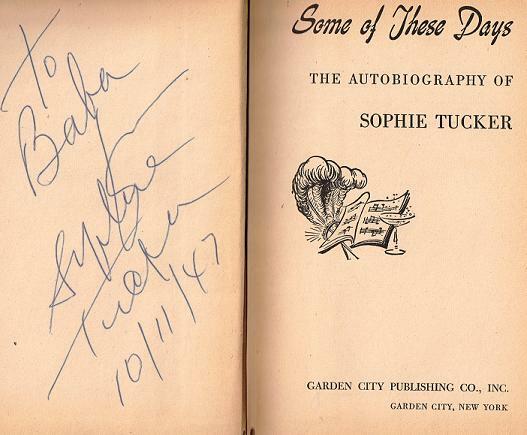 SOPHIE TUCKER. Some of These Days [Autobiography]. New York, Doubleday, 1945. 309pp. Photos on endpapers; DJ. yellowed paper. Front Endpaper Autographed by Tucker. "Very readable ... quite entertaining ... totally enjoyable. If you love reading about the world of entertainment in other eras ... this book is definitely for you! Unlike many 'star' autobiographies, Sophie tells it how it really was, the hard work, the hard luck ... and the thrills in making people feel all of your inner emotions in just a few short minutes. How grateful she was for being a favorite entertainer of so many wonderful audiences! This is one really cool read! Don't let this one get away." 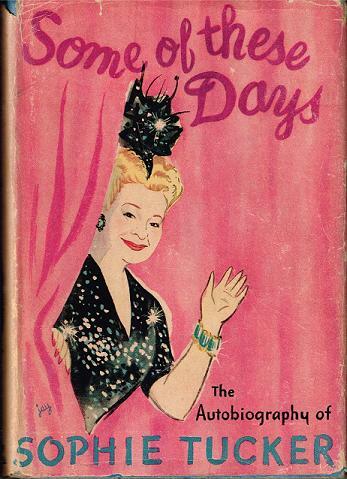 "Autobiography of star of Vaudeville and Tin Pan Alley Broadway. 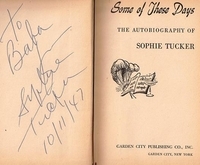 Tucker began her career singing in a New York beer garden, traveled the small-town circuits and burlesque and eventually graduated to star status at the Palace and Ziegfeld Follies."